Preheat oven to 400 degrees. Whisk together dry ingredients. Work in cold butter with forks or pastry blender until the mixture is crumbly. Gently stir in additions. Whisk together eggs, milk, and vanilla until frothy. Add to dry ingredients, stir until well blended. Drop by teaspoonfulls onto parchment. Bake 15-20 minutes until browned lightly. Add ins can be any number of things. 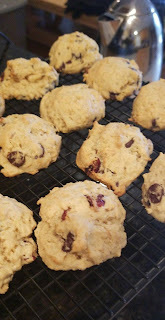 The ones pictured are dried cranberries and non-dairy chocolate chips. Nuts would be yummy. Also, I think grated cheese and rosemary would be good for a savory scone! You could roll them out like a more traditional scone. However, "drop scones" like the ones pictured, are quick and easier for smaller portions to share and to (try to) eat less! These have been enjoyed by those who aren't limiting their diets of gluten and dairy. My house has been gluten free for the last year, at least on the way to it, and these have been such a blessing! I adapted the recipe from this one. I have no intentions of trying to steal credit! I just wanted to make it easier for those who are limiting their exposure to the same foods as me!